Believe it or not, Skeye captured this incredible shot of Mardalsfossen blindly. 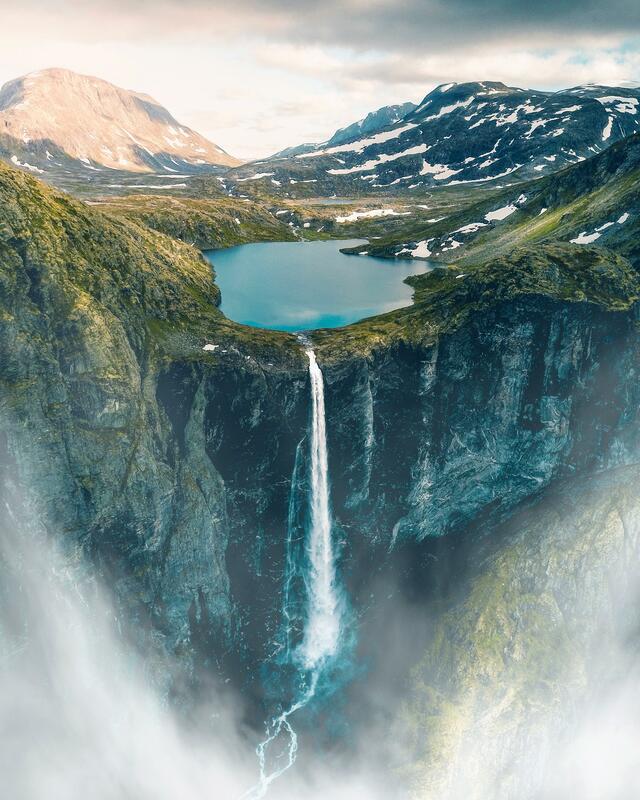 Initially, he flew his drone over 700 meters high to the edge of the waterfall, but once the drone made it to the clouds he found that he had lost the image transmission signal. Nestled in the beautiful Norwegian countryside, the photographer decided to snap a few shots into the unknown, completely relying on the drone’s internal GPS feedback. He returned to the lift-off point to see what his leap of faith yielded. While it’s hard to take a bad photograph in such an amazing setting, Skeye wasn’t expecting the outstanding results of his flight: a stream free-falling from a ledge that seems to disappear into a thick mist. But the lovely content and composition weren’t the only things that attracted us to this particular image. We found that this photographer’s willingness to take a chance was what put this shot over the edge.